This is a once or twice in a lifetime experience, and most people will remember where they were and who they were with when it happened. The amazing holes on these courses will make this event even more memorable for golfers. Myrtle Beach Golf Trips is offering golfers a chance to see the August 21, 2017 total solar eclipse from two beautiful golf courses by the sea. Pawleys Plantation Golf Club and Founders Club at Pawleys Island, which are both in the band of totality, will hold 1:30 p.m. shotgun starts in celebration of the solar event. The 1:30 p.m. start will give golfers time to get out to their assigned holes and begin their rounds before the total eclipse occurs at just about 2:46 p.m. Outside of the slim band of totality across the nation, everyone else will see a partial eclipse. The last time the mainland U.S. saw a total eclipse was in 1979 and only five northwestern states were in the path of totality at that time. On August 21, the sky within the 71-mile-wide path of totality is expected to take on a dark blue hue and shadows will become sharper. Meteorologists say the temperature could drop more than five degrees. People travel from all over the world to get to the path of totality because only in totality can you see celestial objects that you wouldn't be able to see any other time. It's recommended to wear safety glasses and the golf courses will provide a pair of safety glasses to every golfer who tees off at 1:30 p.m.
Pawleys Plantation is surrounded by 200-year-old moss draped oaks, but its wide fairways provide plenty of opportunities for golfers to view the eclipse. The front nine of this Jack Nicklaus design is punctuated by beautiful ponds and lakes, and the back nine is revered as one of the most scenic on the Grand Strand. The par 3 number 13 hole juts out into the salt marsh and has water on three sides, demanding a precision shot to the green, then rewarding golfers with a spectacular view of the marsh, creek and Pawleys Island. The par 4 number 16 shares those views as it doglegs its way back to salt marsh while tempting golfers to pull out a long iron and hit a green well-protected by bunkers. 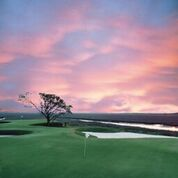 At Founders Club, former Gary Player lead designer Thomas Walker has built a dunes-filled course with a unique seaside feel. More than half of the holes feature lakes or wetlands. Several fairways slope toward water, but Walker provides bail out areas and waste bunkers to save errant shots from a watery grave. Founders features elevated green complexes with generous putting surfaces so players will have ample opportunity to enjoy exceptional views of the eclipse from the course. The par 5 number 6 stretches out over a large waste bunker with a lengthy pond on the left side providing lots of challenge and a very scenic backdrop for those pausing to put on their special glasses and check out the event in the sky. The course ends with its spectacular par 4 number 18 with a fairway that snakes its way between two massive waste bunkers, around a wide pond and ends at the beautiful Lowcountry-style clubhouse with its wraparound porch. Golfers can cap off this special event with the Total Solar Eclipse cocktail, while supplies last. The dark rum floater casts a dark shadow across the orange sparkling beverage, just as the moon will black out the sun. The round at each course starts at $42 per golfer. Golfers can book this amazing opportunity at MyrtleBeachGolf Trips.com. The area's premier resource for tee time bookings, Myrtle Beach Golf Trips has been putting together great golf experiences for customers since 1927, by providing access to award-winning courses, multi-round tee time specials, and golf and lodging packages at the best prices. Owned by Founders Group International (FGI) and with the help of Golf Insider’s 100 percent player-generated course ranking system, Myrtle Beach Golf Trips helps thousands of golfers plan and assemble their ideal golf itineraries. Golfers can choose from “top-100 caliber” courses Pawleys Plantation Golf & Country Club, Grande Dunes Resort Club, TPC of Myrtle Beach, King’s North at Myrtle Beach National Golf Club, Pine Lakes Country Club and more than 80 other Myrtle Beach area courses. More information about Myrtle Beach Golf Trips and Founders Group International, is available at http://www.foundersgroupinternational.com, http://www.mbn.com or MyrtleBeachGolfTrips.com.